This volume addresses salient theoretical issues concerning the validity of research methods in second-language acquisition, and provides critical analysis of contextualized versus sentence-level production approaches. The contributors present their views of competence versus performance, the nature of language acquisition data, research design, the relevance of contextualized data collection and interpretation, and the desirability of a particularistic nomothetic theoretical paradigm versus more comprehensive consideration of multiple realities and complex influencing factors. This book presents varying and antithetical approaches to the issues, bringing together the thinking and approaches of leading researchers in language acquisition, language education, and sociolinguistics in an engaging debate of great currency in the field. Contents: Preface. S.M. Gass, A.D. Cohen, E.E. Tarone, Introduction. Part I: Evaluating Competing Frameworks. F.R. Eckman, The Competence-Performance Issue in Second-Language Acquisition Theory: A Debate. G.P. Berent, The Subset Principle in Second-Language Acquisition. K. Bardovi-Harlig, Anecdote or Evidence? Evaluating Support for Hypotheses Concerning the Development of Tense and Aspect. L.K. Hagen, Constructs and Measurement in Parameter Models of Second-Language Acquisition. N.P. Markee, Toward an Ethnomethodological Respecification of Second-Language Acquisition Studies. Part II: Methodologies for Eliciting and Analyzing Language in Context. 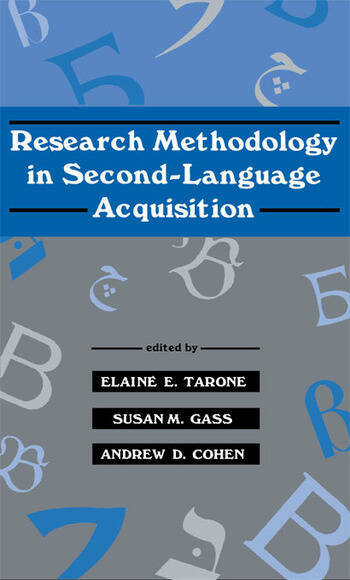 D. Douglas, L. Selinker, Research Methodology in Context-Based Second-Language Research. E. Shohamy, The Role of Language Tests in the Construction and Validation of Second-Language Acquisition Theories. A.D. Cohen, E. Olshtain, Researching the Production of Second-Language Speech Acts. R. Bayley, Interlanguage Variation and the Quantitative Paradigm: Past Tense Marking in Chinese-English. Part III: Methodologies for Eliciting and Analyzing Sentence-Level Data. U. Lakshmanan, K. Teranishi, Preferences Versus Grammaticality Judgments: Some Methodological Issues Concerning the Governing Category Parameter in Second-Language Acquisition. F.R. Eckman, Local and Long-Distance Anaphora in Second-Language Acquisition. E. Munnich, S. Flynn, G. Martohardjono, Elicited Imitation and Grammaticality Judgment Tasks: What They Measure and How They Relate to Each Other. R. Bley-Vroman, C. Chaudron, Elicited Imitation as a Measure of Second-Language Competence. N. Goss, Z. Ying-Hua, J-P. Lantolf, Two Heads May Be Better Than One: Mental Activity in Second-Language Grammaticality Judgments. R. Cowan, Y.A. Hatasa, Investigating the Validity and Reliability of Native Speaker and Second-Language Learner Judgments About Sentences. S.M. Gass, The Reliability of Second-Language Grammaticality Judgments. E.E. Tarone, A Summary: Research Approaches in Studying Second-Language Acquisition or "If the Shoe Fits..."